Cardiff manager Malky Mackay has hinted that striker Craig Bellamy is ready to return and play for Wales. Wales play Austria in an international friendly at the Liberty Stadium on Wednesday, 6 February. Manager Chris Coleman names his Wales squad on Thursday and Bellamy's return for his country is looking increasingly likely. "It would be fantastic for Chris if Craig plays because he is a top player," said Mackay. My own view is that players are picked to play for their national team and they should be proud and should go. "He is a leader and he is someone, at the moment, in a fantastic vein of form." The 33-year-old striker, capped 70 times, missed Wales' last four 2014 World Cup qualifiers because of injury. Coleman has publicly urged Bellamy to say whether he still wants to be involved in the squad, but Bellamy has always remained noncommittal. The Wales manager has said the door is open for Bellamy to return to the squad, but stressed he will not "beg any player to play for their country". But Mackay revealed that Bellamy still holds Wales close to his heart. "We had a good chat in Dubai, concerning a lot of things," said Mackay. "My own view is that players are picked to play for their national team and they should be proud and should go. "I know Craig is certainly someone through his whole career has put his national team first. It's a great credit to him. "I know people want me to say that I don't want him to go and I want him to stay here and be as fit as possible but I was very proud, at a late age, to play for my country." Bellamy has readily admitted that he is determined to look after his body, which has had more than its fair share of injuries, as he enters the twilight of his career. 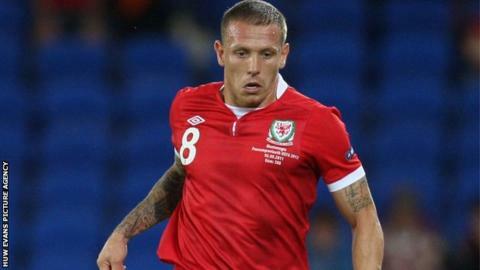 Having played in two international friendlies before the start of the season, a calf injury prevented Bellamy from playing for Wales in the World Cup qualifiers in September against Belgium and Serbia. He returned to fitness to play in four games in three weeks for Cardiff, but picked up a knee injury that forced him to miss Wales' next qualifiers against Scotland and Croatia. An ankle injury then further disrupted his season, but the former Liverpool and Manchester City striker has been injury-free since mid-November and was able to start four games in 11 days for Cardiff over the Christmas period. "I think recently he has shown, through his own work and our medical team's work, he can play four games in 10 days," said Mackay. "If he feels he can manage his body to go away and help the international team, as well as the passion he has for the football club [Cardiff], then all the better to Wales." Bellamy, who has scored 19 goals for Wales, is the fifth highest goal-scorer in Wales' history, behind Ian Rush, Trevor Ford, Ivor Allchurch and Dean Saunders.